I know the spirit of Throwback Thursday is supposed to be old pictures of yourself, but I’ve been doing that for 11 years now, and if you’re looking for a catalog of my bad hair and wardrobe styling through the years, go here and start from the bottom. Have a drink whenever my hair is too blonde. 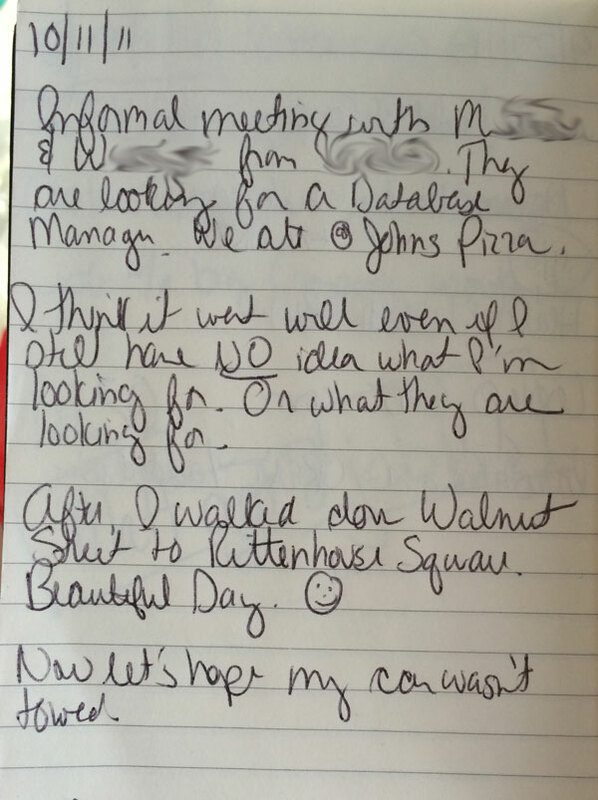 This weekend as I was cleaning off my bead table, I found a notebook from three years ago. Give yourself a second to think about that horror. The notebook was titled “Operation Escape Hatch” and it was all of my notes and plans for leaving the C-P. Historians from the future please note: In 2011-2012 the economy was so craptastic that a it took 38-39 year old, college educated, employed woman with 20 years of work experience eighteen months to find a job. Yeesh. This are the notes I took after my very first “interview” with TNP in October, 2011. (I didn’t start ’til January 23.) It wasn’t a full-on interview because the job wasn’t posted yet, but future historians note: in 2011-2012 the economy was so craptastic that even with all of the above going for me, I still had to rely on networking to get this interview. Informal meeting with M— and W– from TNP. They ware looking for a Database Manager. We ate at John’s Pizza. I think it went well even if I still have NO idea what I’m looking for. Or what they are looking for. Now let’s hope my car wasn’t towed. I had the $5.00 2-slice special, because 1) I didn’t want to seem expensive and 2) I didn’t want them to know I can eat at least a half of a pizza by myself and 3) Cheesesteaks with fried onions and ketchup, while divine, are messy and stinky.